To Balla on the "Ships starting with B" page. Delivered in Nov.-1923 as Margretian from Charles Hill & Sons, Bristol (148) to Owen & Watkin Williams Co., London. Sold in 1928 to Stewart & Esplen Ltd., London and renamed Gresham. Sold to Th. Brøvig, Farsund in 1937 and renamed Balla. Captain: Oswald Christensen (from 1942 - previously served on Rita). Errors may exist, and as can be seen, this record is incomplete (several voyages are missing). Aug. 4 Milford Haven   OB 194 Convoy dispersed in 54.36N 18.02W Aug. 10. Oct. 3 Clyde   OB 223 For Hampton Roads. Traded west coast of U.S.A. till Jan. 31-1941. Traded in the Caribbean until end 1941. Aug. 30 New York City Sanchez Sept. 7 NG 383 Independent from off Guantanamo. Traded east coast of U.S.A./West Indies to Aug.-1945. Oct. 15 New York City Charleston S.C. Oct. 19 NG 392 Convoy available at link above. It'll be noticed, when going to Page 1 of the archive documents, that Balla appears to have had a long stay in New York in the spring of 1940. She had arrived there from Kingston, Jamaica on May 3, proceeding to Halifax on June 1, arriving there on June 10. She had been scheduled for Convoy HX 49 on June 9, from which Randsfjord and Eli Knudsen were sunk (follow the links for details), but instead joined Convoy HX 50 on June 13. She had a cargo of copper and sugar and it looks like she was initially bound for St. Nazaire, but she arrived Cardiff on June 28, continuing to Avonmouth the next day, then on to Bristol, where she also had a long stay. With Beth, Fernbrook, Granli and Madrono, she later joined Convoy OB 194 (originated in Liverpool Aug. 6-1940, dispersed Aug. 10) - ref. external link provided in the table above. No destination is given for Balla, but she crossed the Atlantic again, arriving Wabana on Aug. 15, returning to the U.K. later that month in the slow Sydney (C.B.)-U.K. 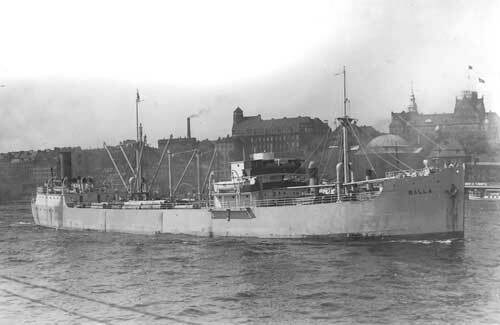 Convoy SC 2, in which the Norwegian Gro and others were sunk (again, follow the links for more info). Balla had a cargo of iron ore for Middlesbrough, and is said to have been cancelled from Convoy HX 68. According to Page 1, she arrived Greenock on Sept. 10. She can now be found in Convoy OB 223, which originated in Liverpool on Oct. 3 and dispersed on the 8th; Balla started out from Clyde Oct. 3 - A. Hague says she became a straggler from this convoy on Oct. 7. Again, see the external link provided within the Voyage Record for more info on the convoy (Polarsol and Solstad are also named). Balla's destination is given as Hampton Roads; going back to the archive document, we learn that she arrived New York on Oct. 23, proceeding to Hampton Roads on Nov. 12, with arrival there the next day. That same year she was put into service around the U.S. due to continuous problems with her engines, which made her unfit for Atlantic crossings (she was equipped with two German motors from 1930, a type intended for U-boats). They continued to cause problems and on one occasion, while on a voyage from Balboa (where she had gone in for repairs) to Houston, the captain had to put his crew to the task of sewing sails, which helped them get safely through the Gulf of Mexico and into Galveston. Not sure, but this may have been in early 1941? According to Page 1, she had arrived Balboa on Jan. 31 that year, remaining there for quite a long time, later arriving Galveston on March 14 (it also looks like she had a long stay in New Orleans that spring/summer and again that fall). Page 2 has some more 1941 voyages; this document also shows her 1943 voyages - it'll be noticed that she made no voyages in 1942. The problems with her engines had caused her to be laid up for a while, but at the very end of 1942, it was decided to get her repaired and put her into service again with new engineers who knew their profession. These engineers came from the torpedoed Andrea Brøvig; Chief Engineer Henry Deitz, 2nd Engineer Finn Syvertsen and 3rd Engineer Martin A. Lervik. Her first voyage in 1943 was made on Aug. 19, when she sailed from Philadelphia to New York (according to Page 2, she had been in Philadelphia since the end of Dec.-1941). From New York, she joined Convoy NG 383, which left on Aug. 30-1943 and arrived Guantanamo on Sept. 6. A. Hague says she proceeded independently to her destination from off Guantanamo, and arrived Sanchez on Sept. 7. The following month, she appears in Convoy NG 392, leaving New York on Oct. 15, arriving Guantanamo on the 21st; however, Balla was bound for Charleston, S.C., where she arrived on the 19th, proceeding to Key West the next day. Elise and General Ruge are also named in this convoy. Together with Notos, Balla is also listed in Convoy KG 666, which left Key West on Oct. 26 and arrived Guantanamo on the 29th. This time her destination was San Juan, where she arrived on Nov. 1. The rest of her 1943 voyages are shown on the archive document. Her 1944 voyages also start on Page 2 and continue on Page 3. In June-1944 we find her (with Pollux and Primo) in Convoy KG 711, leaving Key West on June 7 (arrival Guantanamo on the 10th), Balla arriving Nuevitas on June 9. A couple of months later A. Hague has included her in Convoy NK 631, which departed New York for Key West on Aug. 9. Balla, however, was again bound for Charleston, S.C., where she arrived on the 12th. The rest of her 1944 voyages are shown on Page 3, which also has some 1945 voyages (showing a long stay in New York at the beginning of that year), while the rest are listed on Page 4 (to Apr.-1946). 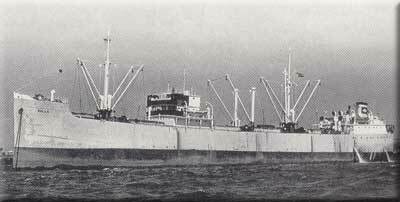 Sold in 1961 to Transportacion Maritima Mexicana, Vera Cruz and renamed Guadalajara. Sold for breaking up in 1968. Back to Balla on the "Ships starting with B" page. The text on this page was compiled with the help of: "Nortraships flåte", J. R. Hegland, "Skip og menn", Birger Dannevig, E-mails from Roger W. Jordan - and misc.